Bernard Hopp opened his "Travelors' Conveniences" store soon after buying it at auction during the time of New Island's independence in 1992. It was originally a Soviet military outpost guarding the tracking station further up the road, on the northern coast. At first he lived here very quietly, seeing perhaps one traveler every three days or so. After settling into the spacious quarters upstairs (There were still Soviet navy rations in the pantry! ), he began to stock the old guardroom with groceries, camping and walking gear, candles, some tools, socks, underwear and tire repair kits. Meanwhile he collected and read comic books. He loves them, especially Little Lulu, Donald Duck, Uncle Scrooge, Bugs Bunny, Daffy Duck, etc. from the 1940s through about 1960. He also collected old Mad magazines from the '50s and '60s, then later the best underground comics such as the entire Zap series and anything by Robert Crumb - the best from the late '60s through the '70s. He has them all! After a while, Bernard put up a sign on his counter advertising comic books, with a few on display. Since then he has slowly become known as the go-to guy for comic books on New Island. He sells a lot more groceries and sundries these days, since traffic has climbed to about six to eight vehicles a day, and they always stop. Since our first visit, he has planted some ghost-gum trees, and he is proud of the new outhouse. The road people paved a few hundred feet in concrete to keep the dust down. We parked our solar-booster recumbent bike in the lot with a new Felix-hauler (by the building) and someones horse. We arrived today just after a rare desert thunderstorm, so everything was wet, and we expect wildflowers in a few weeks! 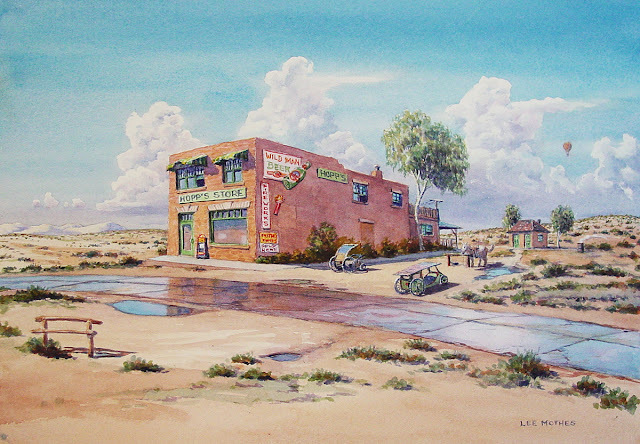 Hopp's Store is in the Sheffield Desert. then proceed north about 21 miles and you'll see it.